The sun slid into the sea and the river drunk its lemon and pewter light and held it a while, like a lantern. Swallows have murmured and gone, and white geese flown to the coast in a fluid wave which reflected the profile of the Dyfi hills across the river. Barnacle geese at Breakwater Hide have settled into their downy camps and in the lake, pintail ducks tucked in their heads. It is dusk and it is warm. A half moon waxes overhead and the air smells of track-dust and swamp. And now, lights small as glow-worms appear, casting little pools of colour on the boardwalk in which sometimes a grass-head or oak leaf is caught. 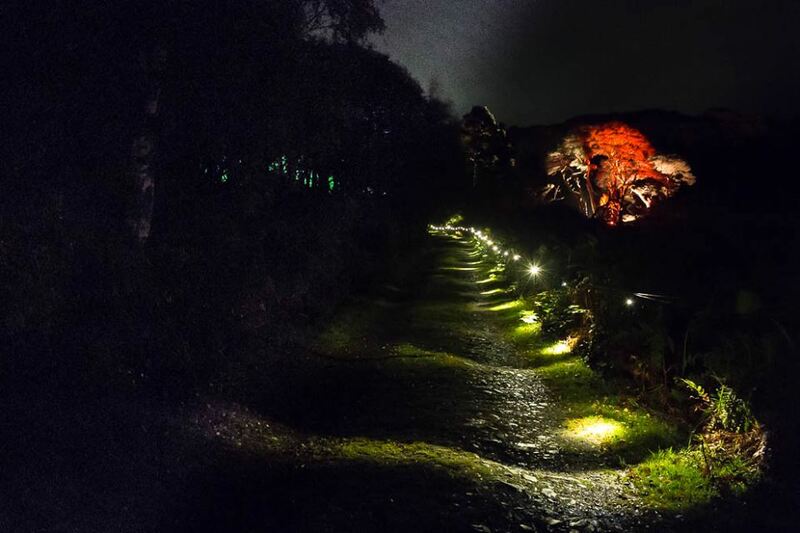 The lights are here to guide you around For the Birds – a trail of sound and light and sculpture through the RSPB Ynys-hir Reserve which takes place each evening between the 2nd and 5th of October. The birds have roosted but the people are arriving – by the coach load. For the Birds artists Jony Easterby, Dark Spark, Kathy Hinde and Esther Tew, and the production team work in mid-Wales. Their aim is to provide an art experience which is inspired by and embedded in, nature. The real avian residents of the reserve are absent because care has been taken not to disturb them – the artists have worked in cooperation with and with the full support of, the RSPB. Reserve Manager David Anning is keen to embrace the ‘daring and different’ perspective on bird life at Ynys-hir that the art trail can provide. 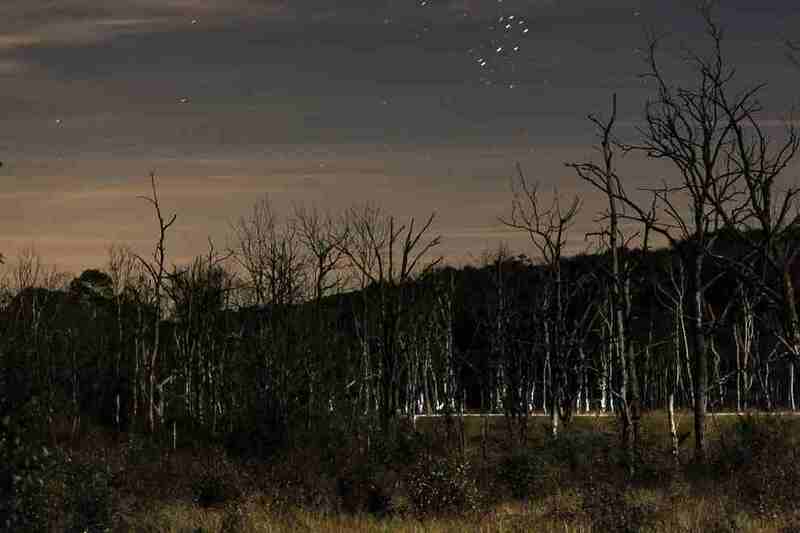 And so we circumnavigate the Reserve by fairy light, or so it seems. At frequent intervals light and sound sculptures absorb us. A blue light rips through the dark with a barn owl-like scream. A lapwing, fiery as an angel, repeats its faltering flight above the salt-marsh. The belly bellows of cuckoo clocks call to each other among the reeds, and like gun-fire or frost-crack, the birch trees retort and reverberate. And a field of grass becomes a phosphorescent sea. It ripples silently in the warm breeze. Crouched at ground level it seems that you swim beneath its luminous waves. Some of the sound sculptures are less tranquil, almost Hitchcock-like in their discord, because always you are rapt in a twilit world that is unreal but almost remembered. It is the familiar things that cause disorientation – little mechanisms from barrel organs that click and wind, or the gramophone crackles of real birdsong accompanied by a cellist who plays poised like an oil painting. Or a ghost. The silhouettes of swallows on telegraph wires flit and play across the guts of a piano – so you almost believe that real wings brush the strings. The artists have succeeded in their aims – art and nature are inter-dependent. The sculptures are bewitching but they are always part of the night. You are as aware of the swoop of hills, the smell of the ground beneath your feet and the profile of trees, like coral, like bones. You see the moon and the stars and if you listen carefully, beyond the orchestra of automota, you hear the estuarine nocturnal squabble of the geese. The art celebrates but is not for the birds – for the birds are gloriously, wildly, indifferent. Verse taken from the poem ‘Belonging’ by poet RS Thomas who spent several years during his time as vicar of St. Michael’s Church at Eglwysfach, watching birds at Ynys-hir.